Same news, different month! Tooele County rolling! Well, it seems that it's the same news, different month! Tooele County Real Estate keeps rolling along. Sales for August were down a bit at -3.2%. However, this translates to only 3 homes less than last year. However, both median and average sales prices were up to $177k and 188k, respectively. Year to date, those numbers are up around 7%, to 170k and 184k. That's a nice, sustainable increase! Days on market is down almost 20% for the month, to 55 days. I believe some of this can be attributed to shorter turnaround time on the USDA Rural loan programs, still the favored product in Tooele County. For the year, days on market is actually up by 4% at 74 days. Speaking of local knowledge, the percentage of original list price received by sellers was up for August to 97%! For the year, sellers are getting over 95% of original list price. 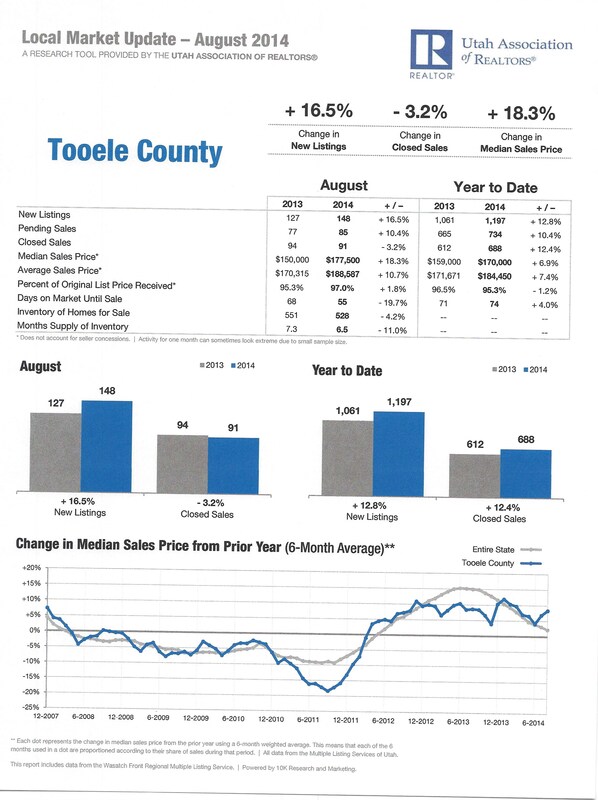 Again, Tooele County Realtors are pricing things right, and buyers are paying market value for homes, which is how it should be in a stable market. Tooele County Real Estate is going to continue to appreciate, as the world discovers the values, the convenience and the quality of life we have to offer. But for now, it's same news, different month in Tooele County!